Welcome to the first card preview of the New Mutants Issue from Vs System® 2PCG®. One design question that comes up a lot is whether to add new characters to an existing team or to make a whole new team for them. It’s a balancing act between the excitements of adding a new team and there being so many teams that it’s hard to track what’s going on. 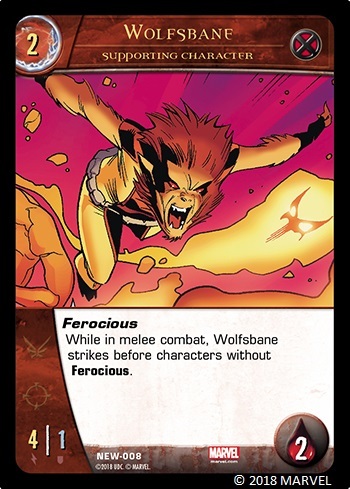 There are also other factors such as how giving new cards to an existing team opens up new deckbuilding options for them including making a Loyal (single team) deck a more viable choice. 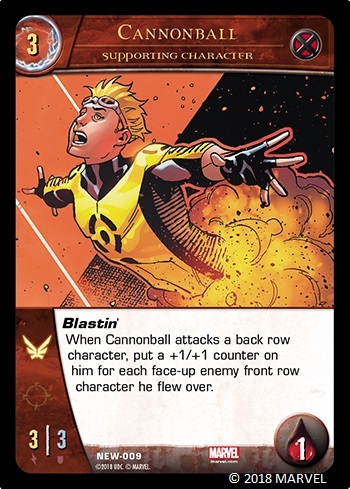 Conversely it can be really hard to build a Loyal deck for a new team that might not yet have a lot of cards. 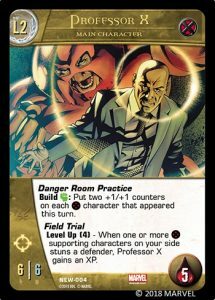 At one point in our design of Vs System® 2PCG®: Deadpool & Friends, we were actually going to create a whole new team, but we felt we wouldn’t be able to revisit that team with new cards often enough to make them viable on their own. So in the end they became part of the Underworld. 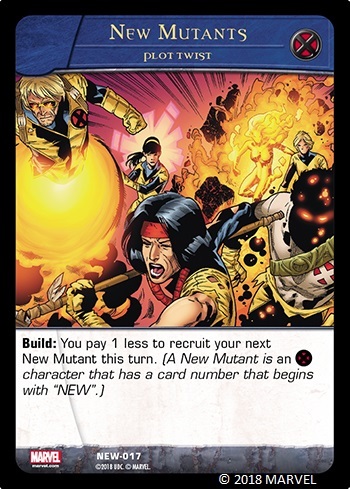 Every character in this Issue has a card number (located at the bottom of the card) that starts with “NEW”, which means it’s a New Mutant. This way we can refer to these characters specifically while having them be a part of the larger X-Men team. You’re probably wondering what new characters you can recruit with their new plot twist. Here are a couple of little mutants you can get into play early. 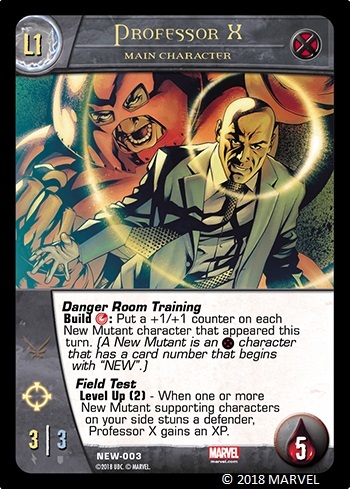 And when a New Mutant grows up to be a full-fledged member of the X-Men the Professor will continue their training. 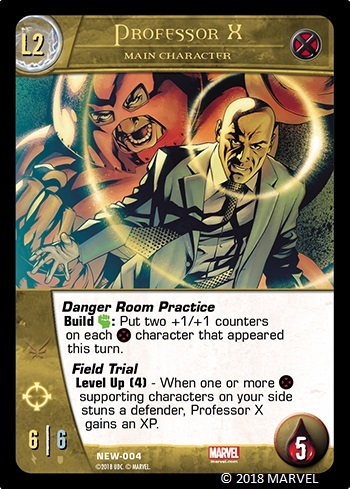 Finally what happens when an X-Men team member is ready to leave the school? When a supporting character Graduates, you’ll remove it from the game and put its main character version into play with the same orientation (ready/exhausted), counters, and any other effects on it (like Freeze). It can gain XP and Level Up normally. You’ll now have two (or more) main characters on your side. 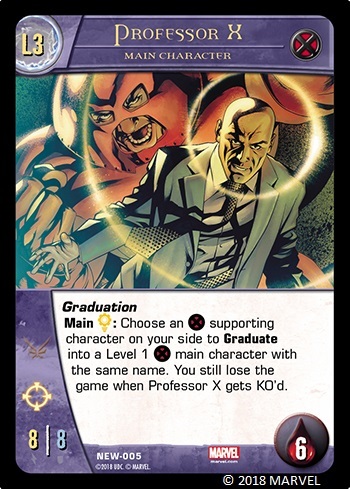 However, you’ll still lose the game if Professor X gets KO’d, he is still the headmaster after all. We hope you enjoyed today’s preview article. Tune in next time for a look at another one of the New Mutant’s teachers. 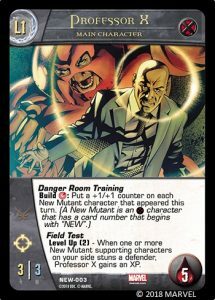 Vs System® 2PCG®: New Mutants hits stores April 18th. We use the same art to help when leveling up. Some MCs have multiple versions and this helps to make sure the correct cards are used. The Main Characters aren’t double sided because when they get stunned they get turned face down.